Kissed by the Moon by Alison Lester, published by Viking/Penguin. This is probably the most traditional choice for babies in my list. Part poem and part lullaby, it’s a very special book for new parents to share with their kids. My review. In the Lion by James Foley, published by Walker Books Australia. Aside from being lots of fun, this children’s picture book introduces little ones to the repetition of a cumulative story. Read more in my review. The Duck and the Darklings by Glenda Millard and Stephen Michael King, published by Allen and Unwin. This one’s an important book, hopefully an award-winner, that’s coming up for review in a week or so’s time. I love it, quack waddle and wing. Children need picture books like this that give them hope for the future. Read my review. The Elephant and the Bad Baby by Elfrida Vipont and Raymond Briggs, published by Penguin. I have loved this book for many years, and it has never left my top ten list. The baby is naughty, the elephant delightfully polite and I have read it aloud so often I don’t need the text. Rollicking rhythm and lots of repetition means kids will internalise the story too. The Jolly Postman and Other People’s Letters by Janet and Allan Ahlberg, published by Penguin. While I probably wouldn’t give this book to a toddler to play alone with, on account of the tiny letters inside, I think it should be in a starter collection of picture books. I still have the version my son received as a pre-schooler, intact (just), and many many other children have shared and enjoyed it. Here’s more information. Silly Galah! by Janeen Brian and Cheryll Johns, published by Scholastic. Every young reader’s library needs poetry in it. This is a vibrant, colourful collection of rhyming fun. Read more in my review. Can You See a Little Bear? written by James Mayhew, illustrated by Jackie Morris, and published by Frances Lincoln/Walker Books. A library collection needs a book that’s book and toy or puzzle in one. In Can You See a Little Bear, kids follow the rhyming text to find named objects in the sumptuous illustrations. Check out my review. Mirror by Jeannie Baker, published by Walker Books. A wordless picture book is another necessity for a beginning collection. Mirror has a stunning design as well as Baker’s trademark collaged illustrations. This is another important book. Check out my review. Owl Babies by Martin Waddell and Patrick Benson, published by Walker Books. This makes a lovely reassuring bedtime story and we all need those! Here’s my review. The Wrong Book by Nick Bland, published by Scholastic. This is one of those special children's picture books that are not so much a linear story as an invitation to play… They remind us that, most of all, reading is supposed to be fun and enjoyable. Kids love to join in and help Nicholas Ickle tell characters they are in the wrong book. By the way, I read over what I said last time I wrote a top ten list, and the same holds true: these are this week's top ten. I fully expect next week's list to be different, but just as wonderful! How about you? 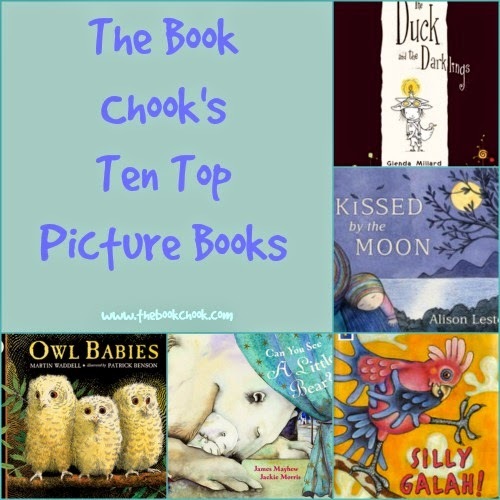 Are any of your favourite children’s picture books on this list? What would you add to it? Chime in via Comments. You might also like to read Beautiful Books for Babies. Find lots of book reviews by clicking Reviews in my right sidebar. I think it is a great list. The Elephant and the Bad Baby never goes off my list either. I might have had a piece of traditional literature such as a folktale or fairy tale as well, a favourite being Why Mosquitoes Buzz in People's Ears or a version of the Billy Goats Gruff. That is an excellent point about the fairy or folk tale. I thought about non-fiction but hoped Mirror would stand in there. Billy Goats Gruff is an old favourite of mine but I don't know Mosquitoes. Off to Google it! I dithered but I persevered. By now of course I am wishing it were more than 10! I love Owl Babies; think I might have added The Kissing Hand. I'm off to look for The Kissing Hand!